TRANSIRA VEREIN ORGANISIERT DER ERSTE SEMINAR FUER FREUNDE DES ELEKTRISCHEN TRANSPORTS. FREITAG 25.11 ANKUNFT IN SIBIU/HERMANNSTADT, WELCOME DRINK UND ABENDESSEN. 15.00 UHR-FAHRT MIT DER TROLLEYBUS DURCH DIE STADT(ABHAENGIG VON DER TEILNEHMERZAHL BESTEHT DIE MOEGLICHKEIT DER MIETUNG EINES TROLLEYBUSES MIT ANHAENGER). 19.00 ABENDESSEN IN DER AELTESTEN RESTAURANT AUS SIBIU/HERMANNSTADT-ZUM GOLDENEN FASS. 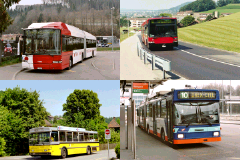 9.00 UHR TREFF IM LUXEMBURGHAUS AM KLEINEN RING.FAHRT MIT DEM TROLLEYBUS BIS DUMBRAVA-JUNGER WALD-WEITERFAHRT MIT DER STRASSENBAHN BIS RASINARI(12KM)-PROJEKT-STRASSENBAHN, VERGANGENHEIT,GEGENWART, ZUKUNFT. MITTAGSPAUSE IM FREILICHTMUSEUM FUER BAEUERLICHE ZIVILISATION, DER GROESSTE DIESER ART AUS EUROPA. RUECKFAHRT MIT DEM BUS AUS DEM MUSEUM. DIE UEBERNACHTUNG MACHT MAN IN 3 STERNE PENSIONEN IN DIE ALTSTADT UND BEINHALTEN FRUEHSTUECK.WEGEN DER PREISUNTERSCHIEDE DER PENSIONEN KONNTE ICH NICHT EINEN FIXEN PREIS BESTIMMEN. PREIS IST ZWISCHEN 50 UND 60 EURO UND BEINHALTET NUR DIE UEBERNACHTUNG IM DOPPELBETTZIMMER MIT FRUEHSTUECK.IM SELBEN PREIS SIND BEINHALTET:KONFERENZSAAL, STADTRUNDGANG, TURMBESTEIGUNG, TROLLEYBUSMIETUNG, TRANSPORT MIT TROLLEYBUS UND STRASSENBAHN. PREIS BEINHALTET NICHT DAS ESSEN IN DEN VERSCHIEDENEN RESTAURANTS UND DER TRANSPORT BIS SIBIU/HERMANNSTADT. 3 p.m.-Trolleybus ride throughout Sibiu. Depending on the number of participants there is the possibility of renting a trolleybus with trailer. Accomodation, including breakfast will be made in 3-star pensions, situated in the medieval town. Because the prices differ from one pension to another, I can't offer you an exact price. The price is around 50 to 60 euros and includes the conference room, the citytour, the visit to the Evangelic Church, renting the trolleybus, the transportation by trolleybus and by tram. The price does not include lunch, dinner and transportation to Sibiu. I would appreciate if I could have an exact answer by 14.11.2005- that way i would be able to make all the rezervations.If you want to bring a partner with you, do let me know.